Presidential Citizenship Award recipient Judge Richard S. Bray and Dr. JoAnn Haysbert, Hampton University Chancellor and Provost, at the 126th Annual Founder's Day Ceremony. 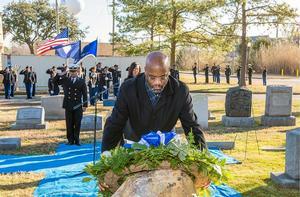 Paul C. Harris, Hampton University Senior Vice President, places commemorative wreath at the gravesite of Gen. Samuel Chapman Armstrong. HAMPTON, Va. (January 28, 2019) – Hampton University alumnus Zachary Scott delivered a moving tribute to several important individuals during the 126th Founder’s Day Ceremony on Sunday, January 27, 2019, in the historic Hampton University Memorial Church. Scott began his address by giving thanks to Hampton University founder Brig. General Samuel Chapman Armstrong. Scott proceeded on by encouraging the crowd to give President Dr. William R. Harvey a round of applause for the growth of Hampton University. Scott, President and CEO of EboxSecure Logistics Group, said that Hampton University is the best education anyone is going to get and he would not trade what he has gotten out of Hampton University for anything. Scott also recognized the Hampton University Board of Trustees for their commission of Legacy Park, which culminates a full year of celebration of Hampton University leadership. Legacy Park includes statues commemorating U.S. Presidents, Civil Rights icons, alumni, Gen. Armstrong, and President Dr. William R. Harvey, Hampton University’s visionary leader and the longest seated university president in the country. 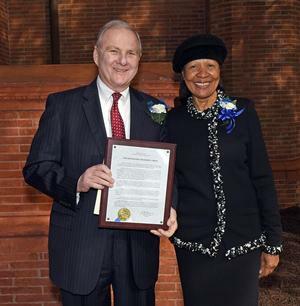 During the ceremony, Hampton University Chancellor and Provost, Dr. JoAnn Haysbert presented the Presidential Citizenship Award to Judge Richard S. Bray, President, and Chairman of the Beazley Foundation. In 1979, President William R. Harvey established this award to recognize individuals who are positive role models for others and who, through their service to their communities, contribute to the values of decency, dignity, and improvement in the quality of life for others. Ms. Carolyn W. Acklin, Office of the President; Dr. Halima N. Ali, Mathmatics; Ms. Janice Bolden, University Police; Ms. Jacqueline Fitzgerald, University Police; Dr. Jose. L. Goity, Physics; Ms. Susane Denise Griffin, Residence Life; Dr. Joy Hendrickson, Political Science and History; Dr. Donald Lyons, Physics; Dr. Zina T. McGee, Sociology; Mrs. Snehlata Pandey, Biology Sciences; Mr. Leo Pickard, Steam Plant; and Ms. Antoinette Tubbs, Harvey Library. 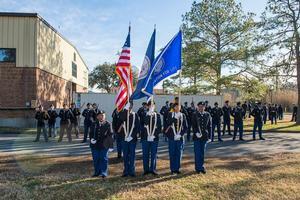 Founder's Day activities began with the commemorative wreath placing ceremony at the gravesite of the University's founder, Gen. Samuel Chapman Armstrong, in the Hampton University Cemetery. 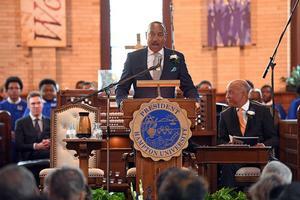 Paul C. Harris, Hampton University Senior Vice President, spoke on an important and time-honored tradition, Founder’s Day. “On this day, we honor our founder, General Samuel Chapman Armstrong, who in 1868 founded this institution we fondly call Hampton University. On this occasion, we reflect upon the man whose vision, leadership and hard work, gave rise to this university, a place we love and to which we now devote our energy. Today we reflect upon the purposes and values that abide as the common thread connecting Hamptonians across generations during which so much else has changed since Hampton’s humble beginnings,” said Harris.